What is it that you like about sailing? Seb’s sister Linda or Tante Linda arrived in Porto on September 4th. We allowed her to settle in for a day and then motored out of the Porto harbour on the afternoon of September 5th. Linda has been absolutely priceless in supporting our move administratively, physically and emotionally and we wanted to show our enormous appreciation by sharing the adventure of an overnight voyage. Our intention was to leave in the early afternoon of September 5th and stop on the morning of the 6th, following a 18 hour voyage, at the beautiful Ilhas de Berlengas archipelago. Just after we hoisted the sails, Linda asked quite innocently, “what is it that you like about sailing?” We smiled at her gently and proceeded to spout out our highly romanticised (and mostly true) perspective on sailing: the incredible sense of freedom, adventure and self determination, the opportunity to spend such valuable time together, access to incredible places off the beaten path, minimal environmental impact, alignment with the elements, working together with the power of the wind and sea etc. etc. And Linda smiled back…completely innocent to what was in store for her. As we sailed out into the sunset and gentle winds we all smiled once again at each other. There is nothing like embarking on a journey with 15 kn winds coming from the beam, gentle waves and a huge orange sun quietly settling into the horizon. We were flying our huge blue gennaker sail and feeling cosy and snug. Our comfort was only too short lived. As we continued further out from land, we left the shelter of the coast behind and the waves started to become choppy and uncomfortable. The winds and waves were at counter purposes with one another and seemed to be fighting at just the wrong angle. Too make matters worse, in our complaisance we had left the gennaker up too long in the rising winds and had a messy and stressful fight to get it down without damage. And the night went on and on and on and became seemingly more and more uncomfortable. Picture yourself in a dark barrel that is spinning and jerking about when you are already feeling tired and as if you may throw up at any minute and your muscles are tight from trying to keep your balance and not bang any soft body bits against hard bits of the boat. Add the sound of blowing wind and crashing waves and you have joined us with your mind. Dawn broke and brought better sight but no additional comfort. And the boat twisted and turned. Just as you thought you were getting used to one rhythm the jester shifted a wave or gusted some wind to fling you into another. The waves and wind were as forecast but the mix was dreadful. Ugh! As we approached Ilhas de Berlengas we saw that it was indeed a unique and stunningly beautiful spot. It also became quite clear that there was absolutely no chance that we could land there in such wonky conditions. Trying to snag a mooring would have been silly and launching the dinghy downright ludicrous. We had tried to prepare ourselves for this possibility in Porto but that did little to ease the disappointment. Sometimes you just want to get off the boat and explore. And that meant another 9 hours to go! Ugh! 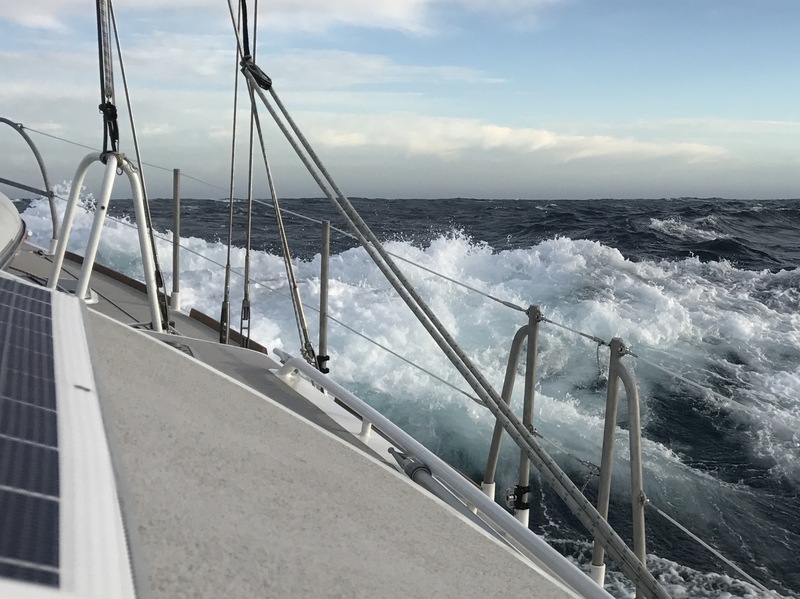 So on we thumped and thumped and eventually we thumped into Cascais, close to Lisboa, 29 uncomfortable hours after departure, threw out the anchor and fell into bed. And sailing. Baaah! Hugely expensive, slow, inefficient, exhausting and horribly uncomfortable. Naah. We do still love sailing, but just like in any relationship some adventures are more testing than others. ***Important note: Seb and I and the monkies had all taken seasickness pills but Linda chose instead to perform a mudra designed to minimize seasickness. A mudra is a symbolic hand gesture that is believed to focus the energy from what we might be experiencing to what we want to feel. What a trooper. For this, her incredibly punishing maiden voyage on the Dutch, she stuck it out holding her mudra position. And, although tired and somewhat nervous, she did not get sick.